DO NOT TAKE large doses of vitamins (megadoses or megavitamin therapy) unless directed to by your doctor. DO NOT STOP USING THIS MEDICINE without first checking with your doctor. IT IS IMPORTANT that you keep all doctor and laboratory appointments while you are using this medicine. BEFORE YOU BEGIN TAKING ANY NEW MEDICINE, either prescription or over-the-counter, check with your doctor or pharmacist. Do you need needles? Purchase needles here. 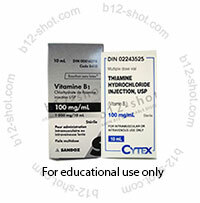 Vitamin B-1 is a water-soluble vitamin needed to process carbohydrates, fat, and protein. Usually found in wheats, fish, and meat. © 2016 B12-Shot.com All Right Reserved. This website is secured with 128bit encryption SSL for your protection.